•74% winners from starters in his first two crops, including two-year-old SW PACHANGA PARTY, multiple $100,000 sp A. P. Cino ($181,033), sp Quick as a Bunny. •MSW/MGSP – average victory margin in five stakes wins was 4+ lengths. •Sped a 110 Beyer and a Rag # 3. •Eight wins in four seasons, from 6f to 1 1/16 miles. •Undefeated at 3, including an impressive 10 1/4-length romp running 1 1/16-miles in 1:41 3/5. •An allowance race at Monmouth Park ($38,000, 11/16 miles in 1:41.79, by 101/4, dftg. Fire Path, Compute, Call My Bluff, Western Territory, Morning Tune, Derek’s Deputy). •A maiden special weight race at Monmouth Park ($37,000, 6 furlongs in 1:11.11, dftg. Caught Ya Catnap’n, Another Deputy, Arctic Tiger, Unleashedthedragon, Lively Sweep, Electric, Cherokee Breeze, Kiss the Flame, New York Token, Lotsa Smarts). 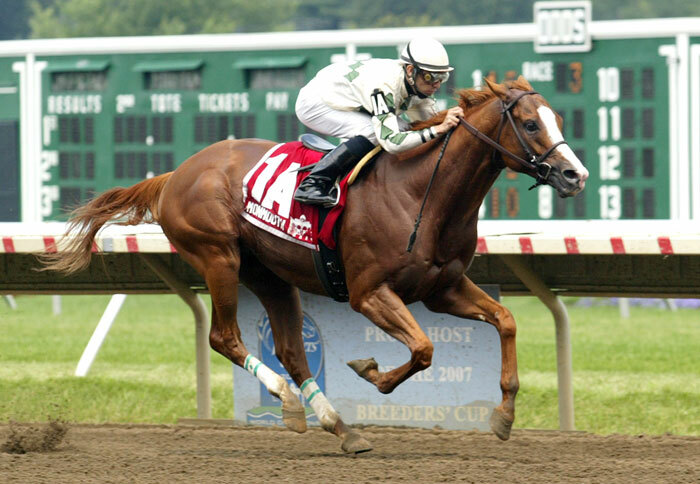 •Alysheba S ($65,000, 11/16 miles in 1:41.98, by 31/4, dftg. Sinners N Saints, Spring House, Malibu Moonshine, Bucharest, Tap Day). •An allowance race at Monmouth Park ($40,000, 11/16 miles in 1:44.75, ETW, by 41/2, dftg. Rises the Phoenix, Mr. Congeniality, Gameboye, Runaway Russy, Master David). •Skip Away S (11/16 miles, to Park Avenue Ball, dftg. Smokescreen, Halos Sailing Sain, Itsawonderfulife, Freedom Isnt Free, Skycrossing). •Skip Away S ($70,000, 11/16 miles in 1:41.33, ETW, by 3, dftg. Touched by Madness, Too Many Toyz, Tap Day, Sleek John, Piety). •Frisk Me Now S ($65,000, 1 mile 70 yards in 1:39.54, dftg. Gottcha Gold, Accountforthegold, Tap Day, Putonyerdancinshuz, High Cotton, Fagedaboudit Sal). 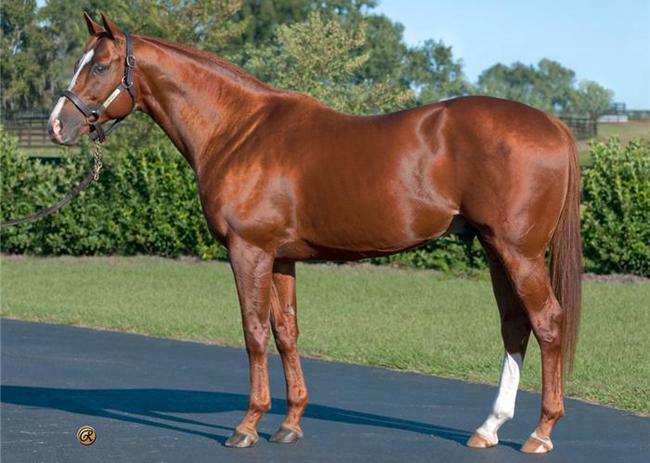 •Alysheba S ($60,000, 11/16 miles in 1:41.21, TW, by 61/2, dftg. Sleek John, Angelic Aura, Chucker). •Philip H Iselin Breeders’ Cup H (gr. III, 11/8 miles, to Gottcha Gold, Brother Bobby, dftg. Master Command, Barbican, Papi Chullo, Tasteyville, Barcola). •Salvator Mile H (gr. III, 1 mile, to Gottcha Gold, Lawyer Ron, dftg. Chucker, Take the Bluff). •Frisk Me Now S ($70,000, 1 mile 70 yards in 1:39.52, by 71/2, dftg. Buffalo Man, Judiths Wild Rush, Longley, Coyoteshighestcall, Eddie C., Digger). •Formal Gold S (11/16 miles, to Shopton Lane, dftg. Rikman, Sinners N Saints). 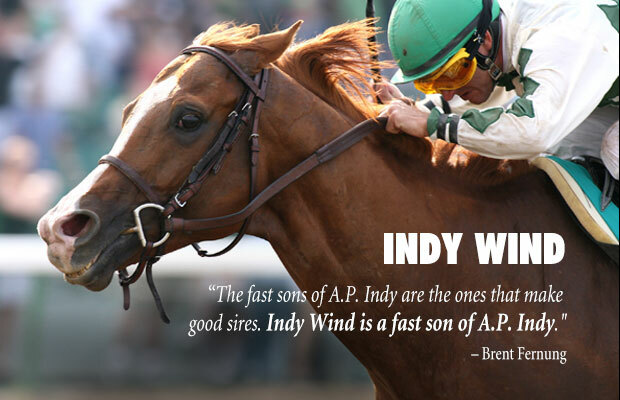 Indy Wind has sired a Multiple Graded Stakes Winner with STARSHIP JUBILEE. Two Time Winner of the G2 Nassau Stakes, 2017 & 2018. 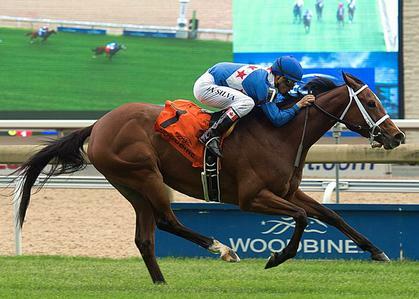 She also won the G2 Dance Smartly Stakes.